Stanisławów Ghetto (Polish: getto w Stanisławowie, German: Ghetto Stanislau) was a Jewish World War II ghetto established in 1941 by the Schutzstaffel (SS) in the prewar Polish city of Stanisławów in the south-eastern region of Kresy (now Ivano-Frankivsk, Ukraine) occupied by Germany after Operation Barbarossa. Before the joint Nazi-Soviet invasion of Poland in 1939 Stanisławów was the capital of the Stanisławów Voivodeship in the Second Polish Republic. The Soviets annexed the city to the Ukrainian SSR in 1939 along with the entire region, but renamed it as Ivano-Frankivsk in 1962, long after the war ended. In 1941 Stanisławów (then, Stanyslaviv) was overrun again, this time by the Wehrmacht army, in the course of the German attack on the Russian positions behind the Curzon Line (see map, marked in red), and incorporated it into their own Distrikt Galizien, as the fifth district of the Generalgouvernement. On 12 October 1941 during the so-called Bloody Sunday, some 10,000–12,000 Jews were shot by the German uniformed SS-men from SIPO and Orpo together with the Ukrainian Auxiliary Police at the Jewish cemetery, into hastily dug mass graves. Dr. Tenenbaum of the Judenrat heroically refused the offer of exemption and was killed along with the others. The size of the massacre was unprecedented. Two months after that, the Stanislau Ghetto was established officially for the 20,000 Jews remaining, and sealed off with walls on 20 December 1941. Over a year later, in February 1943, the Ghetto was liquidated, when no more Jews were imprisoned in it. The Stanisławów County had 198,400 residents in 1931 according to the Polish census. Among them were 120,214 Orthodox Poles (Ukrainian, Ruthenian and Russian), 49,032 Catholics, and 26,996 Jews. The population of the capital grew rapidly from 28,200 in 1921 to 60,000 in 1931 (or 70,000 together with the suburbs incorporated into the city by the 1924 decision of Rada Ministrów). During the interbellum, Stanisławów had a military base for the Polish Army, with two main units, the 11th Infantry Division, and Podolska Cavalry Brigade, both defeated in the September Campaign. During the 1939 invasion of Poland by German and Soviet forces, the province was captured by the Red Army in September 1939. Over the next two years, beginning 8 February 1940 and ending in the June 1941 flight from Stanisławów, the Soviet regime forced thousands of inhabitants of the city to board cattle trains to Siberia, where most of the victims perished. A number of villages were completely emptied ("dekulakization"). The war crimes committed against the Polish nationals included the last minute massacre of 2,500 political prisoners in the city, Ukrainian and Polish alike, during the escape of the NKVD ahead of the advancing Germans. Also women with dozens of children were shot at a secluded Demianów Łaz ravine outside Stanisławów among at least 524 Polish victims who dug their own mass grave. 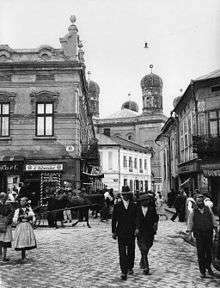 There were more than 50,000 Jews in Stanisławów County when it was overrun by the Hungarian army on behalf of Nazi Germany on 2 July 1941. The Germans arrived on 26 July. On the same day, the Gestapo detachment ordered a Judenrat established in the city. It was headed by Israel Seibald. On 1 August 1941, Galicia became the fifth district of the General Government. A day later, Poles and Jews of the intelligentsia were ordered to report to the police under the guise of registering for placement. Of the eight hundred men who came, six hundred were transported by SIPO to the forest called Czarny Las, near Pawełcze village (Pawelce), and murdered in secrecy. Families (80% Jewish) were not informed, and continued sending parcels for them. The command of Stanisławów was taken over by SS-Hauptsturmführer Hans Krueger who set up a branch office of the KdS in the city. [a] One month earlier, Krüger was involved in organizing the massacre of Lviv professors in occupied Lwów (Lviv since 1945). Under his command, on 8–9 August 1941 more Poles and Jews in Stanisławów were arrested, also teachers, civil servants and professors. 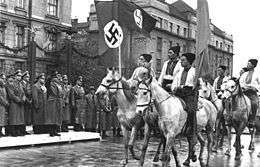 They were summoned according to a list, compiled by the Ukrainian People's Militia who were helping the German Security Police (officially, the collaborationist Ukrainian Auxiliary Police was created in mid-August by Heinrich Himmler). On 15 August, the prisoners were transported in covered lorries to a place near the city, named the Black Forest (Czarny Las) and executed. The number of victims is estimated at 200–300. On 12 October 1941 on the orders of Hans Krueger thousands of Jews gathered at the Ringplatz market square for a selection. The Nazi forces (augmented by the Orpo Reserve Police Battalion 133 brought in from Lemberg, and the Ukrainian police) escorted them to the Jewish cemetery, where the mass graves had already been prepared. On the way, the Ukrainian and German guards beat and tortured the prisoners. At the cemetery the Jews were forced to give away their valuables, and show their papers. Some were released. The shooters ordered the Jews gathered in groups to strip naked and then proceed to the graves. The men of the Sicherheitspolizei (SiPo) were the first to open fire, augmented by members of the Nürnberg Order Police, and the Bahnschutz railroad police. The victims either fell into the graves or were ordered to jump in before being killed. Between 10,000 and 12,000 Jews were murdered: men, women and children. The shooters started firing at 12 noon and continued without stopping by taking turns. There were picnic tables set up on the side with bottles of vodka and sandwiches for those of them who needed to rest from the deafening noise of gunfire; separate for Germans and Ukrainians. They tried to continue after dark with floodlights but finally gave up; and the remaining captives were released. The Aktion, unprecedented in terms of scale in Holocaust history until that date in occupied Poland, was known as the Blutsonntag (de), or the Bloody Sunday. There was a victory celebration held that night at the headquarters. The Bloody Sunday massacre of 12 October 1941 was the single largest massacre of Polish Jews perpetrated by the uniformed police in the General Government prior to genocidal Aktion Reinhardt of 1942. It was preceded by the Red Friday massacre of 5,000 Jews in the Białystok Ghetto on 27–28 June 1941 by the Reserve Police Battalion 309, but surpassed only by the Battalion 45 massacre of 33,000 Jews at Babi Yar in Reichskommissariat Ukraine outside Kiev on 29–30 September 1941; and the final Aktion Erntefest massacre of more than 43,000 Jews at the Majdanek concentration camp and its subcamps on 3 November 1943 perpetrated by the Trawniki men from Ukraine along with the Reserve Police Battalion 101 of the German Order Police from Hamburg. For more details on this topic, see Final Solution. On 20 December 1941 the Stanisławów Ghetto was set up officially, and closed from the outside. Walls were built (with three gates), and the windows facing out boarded up. Some 20,000 Jews were crammed there into a little space. Rationing was enforced, with insufficient food, and workshops set up to support the German war effort. Over the winter and until July 1942 most extrajudicial killings were carried out in Rudolf's Mill (Rudolfsmühle). From August 1942 onward the courtyard of the SiPo headquarters was used for that. On 22 August 1942, the Nazis held the reprisal Aktion for the murder of a Ukrainian collaborator, which they blamed on a Jew. More than 1,000 Jews were rounded up and shot at the cemetery. The leader of the Jewish council, Mordechai Goldstein, was hanged in public, along with 20 members of the Jewish Ghetto Police. Before taking them to the SiPo headquarters, policemen raped Jewish girls and women. The Ghetto was reduced in size after the German and Ukrainian raid of 31 March 1942, and the burning of homes, in punishment for the council's noncompliance with the first deportation action. In April, September and November 1942 regular transports of Jews were sent in Holocaust trains to the Bełżec extermination camp north of the city. More Jews were brought in from smaller towns. About 11,000 Jewish captives subsisted in Stanisławów Ghetto when the next few Aktionen took place. On 24/25 January 1943 some 1,000 Jews without work permits were shot. Further 1,500–2,000 were deported to the Janowska concentration camp for extermination. On 22/23 February 1943, Brandt, who had succeeded Hans Krüger as SS-Hauptsturmführer, ordered the police forces to surround the ghetto in preparation for its final liquidation. The Aktion lasted for four days. Most victims were killed at the cemetery including the Jewish council. Soon later, the Germans put up announcements that Stanisławów was Judenfrei or free of Jews, nevertheless, the police continued searching the ghetto area for more victims until April. The last recorded Jews were murdered on 25 June 1943. Just before the liquidation of the Ghetto, a group of Jewish insurgents managed to escape. They formed a partisan unit called "Pantelaria" active on the outskirts of Stanisławów. The two commanders were young Anda Luft pregnant with her daughter Pantelaria (born in the forest), and Oskar Friedlender. Their greatest accomplishment was the ambush and execution of the German chief of police named Tausch. The group was attacked and destroyed by the Nazis in mid winter 1943–44. Anda and her new baby girl were killed. There were numerous rescue efforts during the ghetto liquidation. When the Jehovah's Witnesses learned that the Nazis planned to execute all Jews in the city, they organized an escape from the ghetto for a Jewish woman and her two daughters who later became Witnesses. They hid these Jewish women throughout the entire period of the war. Among the Christian Poles bestowed with the honour of Righteous Among the Nations were members of the Ciszewski family who hid in their home eleven Jews escaping deportation to Belzec extermination camp in September 1942. All survived. There were also Polish rescuers murdered for saving Jews, like Jan Gawrych, who along with his wife harboured five Jews before spring 1943. Others, like the Tkacz couple who saved the 13-year old Sylvia Andacht, were not recognized by Yad Vashem, but equally helpful. However, in the three years of German occupation almost 6,000 ethnic Poles were sent from Stanisławów to Germany for slave labour and the killings continued. The Soviet army reached the city on 27 July 1944. Hidden by rescuers, there were about 100 Jewish Holocaust survivors liberated. 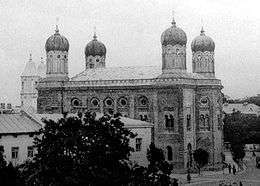 In total about 1,500 Jews from Stanisławów survived the war elsewhere. The commander of Stanisławów during the Bloody Sunday massacre SS-Hauptsturmführer Hans Krüger (de, pl) embarked on a successful career in West Germany after the war ended. He was a chairman of the Association of Germans from Berlin and Brandenburg, and lobbied on behalf of the League of Eastern Expellees representing the interests of former Nazis among others. He run his own firm. Due in part to his life in the public eye, he was questioned by the authorities. Six years later, in October 1965 a formal indictment against Krüger was issued by the Dortmund State Prosecutor's Office. His trial lasted for two years. Krüger sparked outrage for his anti-Semitic outbursts. On 6 May 1968, the Münster State Court sentenced him to life imprisonment. He was released in 1986. Hans Krüger (1909–1988) is not to be confused with Oberamtsrichter Hans Krüger (1902–1971), an SS judge in occupied Poland, and President of the Federation of Expellees from 1959 to 1964 from CDU. Meanwhile, in 1966 there were other trial proceedings held in Vienna and Salzburg against members of the Schupo and the Gestapo police serving in Stanisławów during the war. Following World War II, at the insistence of Joseph Stalin during Tehran Conference of 1943, Poland's borders were redrawn and Stanisławów (then again, Stanyslaviv) was incorporated into the Ukrainian Soviet Socialist Republic of the Soviet Union. Polish population was forcibly resettled back to new Poland before the end of 1946. The city was renamed after poet Ivan Franko in 1962 under Nikita Khrushchev. Since 1991, it is the capital of the Ivano-Frankivsk Oblast in sovereign Ukraine. a. ^ The KdS stands for the Kommandateur der Sicherheitspolizei und des SD, or the Regional Command of the Sipo (Sicherheitspolizei) and SD (Sicherheitsdienst, the intelligence branch of the SS). ↑ Paczkowski, Andrzej (2003). The Spring Will Be Ours: Poland and the Poles from Occupation to Freedom (Google Books). Translated by Jane Cave. Penn State Press. pp. 54–. ISBN 0-271-02308-2. 1 2 3 4 5 6 7 8 9 10 11 Dieter Pohl. Hans Krueger and the Murder of the Jews in the Stanislawow Region (Galicia) (PDF file from Yad Vashem.org). pp. 12/13, 17/18, 21. It is impossible to determine what Krueger's exact responsibility was in connection with "Bloody Sunday" [massacre of 12 October 1941]. It is clear that a massacre of such proportions under German civil administration was virtually unprecedented. ↑ "The 1931 GUS Census. District of Stanisławów". Kresy.co.uk. Retrieved 29 November 2014. ↑ Bronisław Prugar-Ketling (1990). Aby dochować wierności. Wspomnienia z działań 11 Karpackiej Dywizji Piechoty, wrzesień 1939 (Google Books snippet view)|format= requires |url= (help). Warszawa: Wydawnictwo "Odpowiedzialność i Czyn". OCLC 80598026. ↑ Stefan Troebst, University of Leipzig (December 2012). "Studies in 20th Century European History" (PDF file, direct download). Remembrance and Solidarity. p. 37. Retrieved 1 December 2014. ↑ Stanisław Żurek, Kalendarium ludobójstwa: woj. stanisławowskie. (Internet Archive) "Z Halicza wyjechało 400 wagonów z Polakami, ze Stanisławowa 900 wagonów. Wagony towarowe miały pozabijane deskami okna, w kącie wydrążoną dziurę na załatwianie potrzeb fizjologicznych." 1 2 Robert Nodzewski, "Demianów Łaz" IV Rozbiór Polski, 1939. Retrieved 1 December 2014. 1 2 3 4 5 Grzegorz Rąkowski (2007). "Historia Stanisławowa". Przewodnik po Czarnohorze i Stanisławowie (in Polish). Stanislawow.net. Retrieved 7 December 2014. ↑ Gross, Jan T.; Militargeschichtliches Forschungsamt (1997). Bernd Wegner, ed. From Peace to War: Germany, Soviet Russia and the World, 1939–1941 (Google Books preview). Berghahn Books. pp. 47–79, 77. ISBN 1-57181-882-0. ↑ Brian Crozier, Remembering Katyn | Hoover Institution. 30 April 2000; Stanford University. Retrieved 1 December 2014. ↑ Soviet 1941 massacre at Dem'ianiv Laz. Memorial Society (memorial.kiev.ua). Retrieved 1 December 2014. 1 2 Zofia Sochańska, Anna Mirkowska, Eugeniusz Riadczenko, Stanisławów (ob. Iwano-Frankiwsk). Muzeum Historii Żydów Polskich POLIN. Retrieved 29 November 2014. 1 2 PWL. "Mord w Czarnym Lesie (Murder in the Black Forest)". Województwo Stanisławowskie. Historia. PWL-Społeczna organizacja kresowa. Retrieved 9 December 2014. 1 2 Tadeusz Kamiński, Tajemnica Czarnego Lasu (The Black Forest Secret, Internet Archive). Publisher: Cracovia Leopolis, Kraków, 2000. Book excerpts. ↑ Dieter Pohl 1998, p. 6/24. ↑ Robin O'Neil (2011). "Murder of the Lvov Professors". Hans Kreuger moves to Stanislawow. The Rabka Four. Instruments of Genocide and Grand Larceny. London: Spiderwize. pp. 41–63. OCLC 796270628. Retrieved 14 December 2014. 1 2 3 Holocaust Encyclopedia – Stanisławów. 1941–44: Stanislau, Distrikt Galizien. Retrieved 1 December 2014. ↑ Tadeusz Olszański (4 November 2009). "Wkracza gestapo". Opowieści z rodzinnego grodu. Tygodnik Polityka. Retrieved 4 December 2014. 1 2 3 Christopher R. Browning (1 May 2007). The Origins of the Final Solution (Google eBook). U of Nebraska Press. pp. 349, 361. ISBN 0803203926. Retrieved 4 December 2014. ↑ George Eisen, Tamás Stark (2013). The 1941 Galician Deportation (PDF). Holocaust and Genocide Studies 27, no. 2 (Fall 2013): 207–241. The United States Holocaust Memorial Museum. pp. 215 (9/35 in PDF). Retrieved 16 December 2014. More than 10,000 Jews, including 2,000 Hungarian Jews [the so-called “Galicianer” Jews deported out of Hungary], perished on that day – as it happened, on the last day of the Jewish festival of Sukkoth (Hoshana Rabbah). 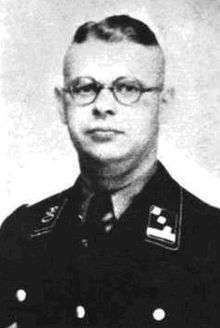 SS-Hauptsturmführer (Captain) Hans Krüger orchestrated the massacre, aided by Ukrainian collaborators and Reserve Police Battalion 133. Notably, Krüger had at his disposal a Volksdeutsche unit, recruited from Hungary, that routinely participated in exterminations. ↑ McKinley von Theme, 1941: 12 Oktober – Erschiessung in Stanislawow. ShoaPortalVienna 2014, den opfern zum gedenken. Retrieved 6 December 2014. ↑ H.M.C., Timeline of Jewish Persecution: 1941. October 12: Bloody Sunday. Jewish Virtual Library. Retrieved 4 December 2014. ↑ "Białystok – History". Virtual Shtetl Museum of the History of Polish Jews. pp. 6–7. Retrieved 7 December 2014. ↑ Browning, Christopher R. (1998) . Arrival in Poland (PDF file, direct download 7.91 MB complete). Ordinary Men: Reserve Police Battalion 101 and the Final Solution in Poland. Penguin Books. pp. 135–136, 141–142. Retrieved 5 December 2014. Also: PDF cache archived by WebCite. ↑ Agnieszka Zagner, Tadeusz Olszański, "Życie kresowe" (PDF file, direct downoad 9.51 MB) Żydowskie Muzeum Galicja w Krakowie. "W tym miesiącu". Słowo Żydowskie Nr 6 (448) 2009, p. 18. ↑ 2002 Yearbook of Jehovah’s Witnesses. — N.Y.: Watchtower, 2001; p. 143. ↑ POLIN, Rodzina Ciszewskich Sprawiedliwy wśród Narodów Świata – tytuł przyznany 23 grudnia 1987. Polish Righteous. Museum of the History of Polish Jews. Retrieved 1 December 2014. ↑ Anna Poray, The Gawrychs, and the Tkacz couple. Saving Jews: Polish Righteous. Those Who Risked Their Lives. Retrieved 2 December 2014. ↑ Albert Norden, "Krüger, Hans: Ein Blutrichter Hitlers" at www.braunbuch.de Braunbuch. War and Nazi Criminals in the Federal Republic. ↑ Bund der Vertriebenen, Hans Krüger, der 1964 BdV-Präsident zurücktreten musste. 20 August 2006. Retrieved 7 December 2014. Dieter Pohl (1998). Hans Krueger and the Murder of the Jews in the Stanislawow Region (Galicia) (PDF file, direct download 126 KB from Yad Vashem.org.il). Trans. by William Temple. pp. 1/24. OCLC 768801015. Source: Yad Vashem Studies, Vol. 26, Jerusalem 1998, pp. 239–265. Dr. Mordecai Paldiel, "83.7 KB". Missing or empty |url= (help)83.7 KB Yad Vashem, The Holocaust Martyrs' and Heroes' Remembrance Authority. Jason Hallgarten, The Rabka Four. Instruments of Genocide and Grand Larceny (Poland) by Robin O'Neil (2011) Chapter 7: Hans Krueger in Stanislawow, Kolomyja and District. Yizkor Book Project. G. L. Esterson, Extermination of the Jews in Galicia by Robin O'Neil Chapter 6: Kolomyja and District Transports to Belzec. Yizkor Book Project 2009.